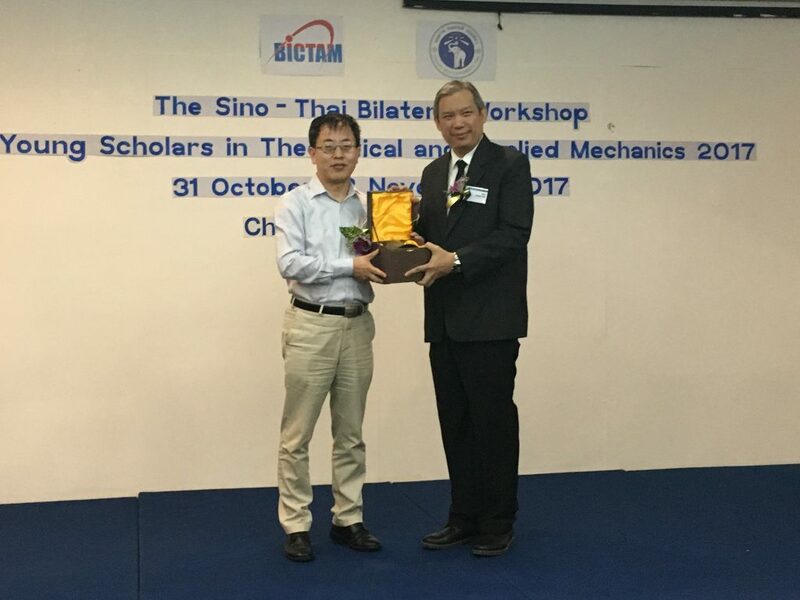 Co-organized by Beijing International Center for Theoretical and Applied Mechanics (BICTAM) and Faculty of Engineering, Chiang Mai University (CMU), The First Sino-Thai Bilateral Workshop for Young Scholars in Theoretical and Applied Mechanics 2017 was successfully held at Chiang Mai University, October 31-Novermber 3, 2017. Nearly 50 participants from more than 20 universities and institutes attended this workshop. The co-chairs of this workshop are BICTAM secretary-general, Professor Xi-qiao Feng, Dean of Faculty of Engineering, CMU, Professor Nat Vorayos, President of Chengdu University, Professor Qingyuan Wang, Chair of International Exchanges and Cooperation Working Committee of CSTAM, Professor Weiqiu Chen and CSTAM vice secretary-general Professor Changqing Chen. On the afternoon of October 31st, The Pre-Conference of The First Sino-Thai Bilateral Workshop was held at RTT Building Auditorium, Faculty of Engineering, CMU. Two Special Lectures were delivered. Professor Qingyuan Wang gave a lecture titled “Super Long Life Fatigue Accelerated Testing Method and its Application”. Professor Baohua Ji presented a lecture titled “How do cells sense and move?” After the pre-conference, both sides went on a laboratory visit in the Faculty of Engineering, CMU, seeking for future collaboration. 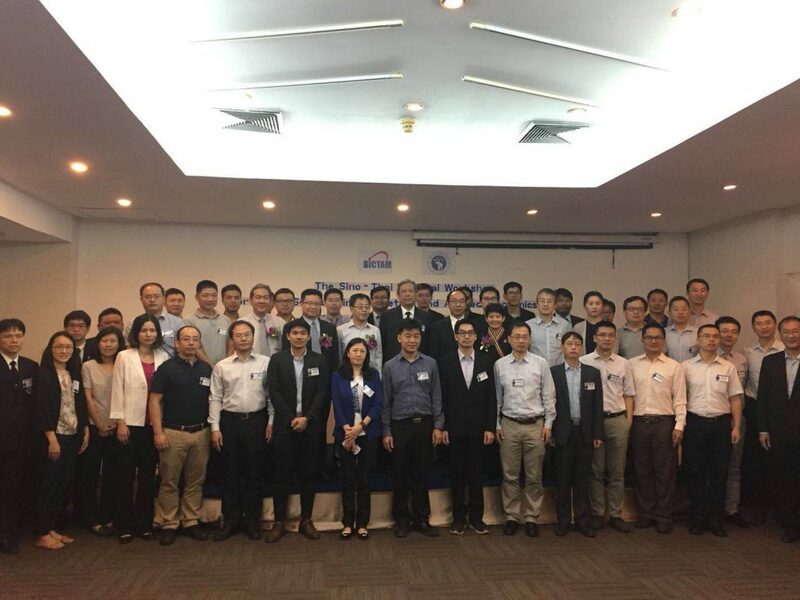 The Pre-Conference of The First Sino-Thai Bilateral Workshop was held at RTT Building Auditorium, Faculty of Engineering, CMU. More than 40 participants from both sides attended. On the morning of November 1st, the opening ceremony of The First Sino-Thai Bilateral Workshop was held at Duangtawan Hotel Chiang Mai. Firstly, Dean of Faculty of Engineering, CMU professor Nat Vorayos delivered a welcome speech. 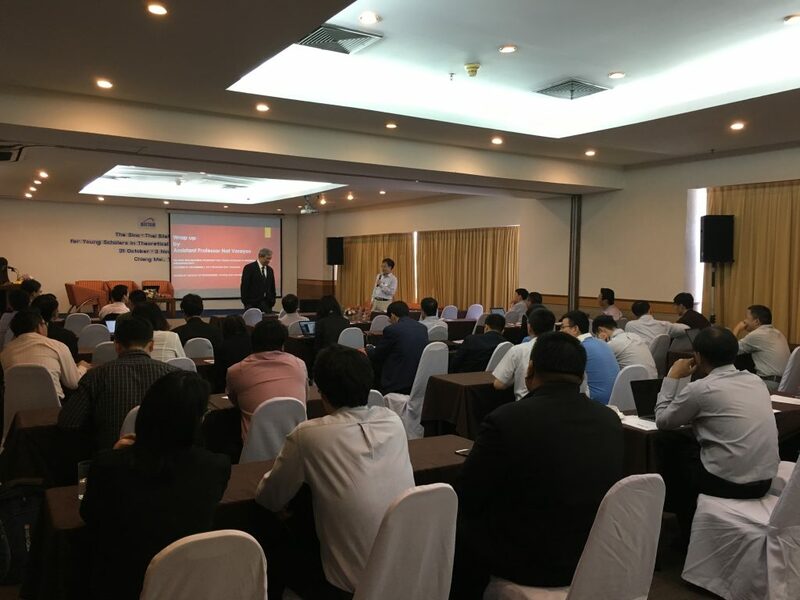 He expressed warm welcome to all the attendees and hoped this workshop could serve as an academic exchange platform as well as provide chances for collaboration between Chinese and Thai scholars. The Consul General of the People’s Republic of China in Chiang Mai Mr. Yisheng Ren delivered a speech and stressed that scientific and technological innovation is the main driving force for social and economic development. CG Ren pointed out that Thailand is an important country along the 21st century maritime Silk Road and also an important partner to jointly build the Belt and Road. Sino-Thai researchers should strive to provide a solid scientific basis for the B&R construction. On behalf of BICTAM, professor Xi-qiao Feng delivered a congratulatory speech. He expressed deep gratitude to CMU and then introduced to attendees that BICTAM is an international non-governmental scientific organization, which is affiliated to IUTAM (since 2010) and operates in close collaboration with the ICSU Regional Office for Asia and the Pacific. He pointed out that Sino-Thai Bilateral Workshop is one of the series programs that BICTAM carried out in the Belt and Road Countries and Regions. He hoped that this workshop could improve the mutual understanding between scholars from two nations, so that the bilateral academic visit could become a regular program in the future. After then, CMU President Assistant, Associate Professor Sampan Singharajwarapan delivered the opening speech. On behalf of BICTAM, Professor Xi-qiao Feng was presenting souvenir to Dean of Faculty of Engineering, CMU professor Nat Vorayos in the opening ceremony. Following the opening ceremony are two keynote lectures. Professor Tanongkiat Kiatsiriroat, chairperson of Thermal System Laboratory, Faculty of Engineering, CMU, presented a lecture titled “Sino-Thai Collaboration: Experiences of Thermal System Laboratory”. He introduced the collaboration between his laboratory and Chinese scholars and looked forward for further cooperation between Sino-Thai scholars. Professor Changqing Chen from Tsinghua University delivered a lecture titled “Mechanics of Foldable Metamaterials”. The lecture introduced the mechanical characteristics and analytical models of foldable metamaterials. The proposed methods in the lecture extend the design space of mechanical metamaterials, and are expected to facilitate the application of foldable metamaterials. Following the keynote lectures, there are 3 parallel sessions focused on “Biomaterials and Biomechnics & Thermo-Fluids”, “Mechanics of Materials and Structures & Dynamics and Controls” and “Multi-disciplinary Mechanics”, respectively. A total of 46 lectures were presented covering a wide range of topics such as solid mechanics, fluid mechanics, dynamics and control, biomechanics, robot manufacturing, engineering thermophysics etc. On November 2nd, the workshop started with summarization of the parallel sessions. Each chair made a comprehensive overview of the session. Besides, all the attendees and their research interests were introduced in this part. After that, a brief closing ceremony was chaired by Professor Nat Vorayos. At the end, Professor Xi-qiao Feng, Professor Zhang Kang, Professor Weiqiu Chen, and Professor Nakorn Tippayawong gave concluding remarks at the ceremony. Both sides expressed wishes to improve bilateral collaboration. Both sides create standing working groups so that to in charge of bilateral information exchanges and routine businesses. The Second Sino-Thai Bilateral Workshop will be held in Chengdu in 2019, organized by Chengdu University. A Memorandum of Understanding signed between both sides. Two bilateral visit programs are agreed to establish. BICTAM and Faculty of Engineering, CMU will be in charge of these two programs. One program is the international youth exchange program for postgraduates. The program will provide opportunity to one or two persons each year to complete the academic visit. Grantees establish professional contacts in their academic field, and enhance their scholarly work, gain international experience and personal enrichment. The other program is the international scholars exchange program. The program will also provide opportunity to one or two persons each year. Grantees may be asked to give public talks, mentor students, and engage with the local academic community so that to help promote mutual understanding between the two nations. Peking University, Beijing Jiaotong University, Beijing Institute of Technology, Chengdu University, Dalian University of Technology, National Center of Nanoscience and Technology, Harbin Institute of Technology, Lanzhou University, Tsinghua University, Shanghai University, Tongji University, Xi’an Jiaotong University, Southwest Jiaotong University, Zhejiang University, University of Science and Technology of China, Institute of Mechanics, Chinese Academy of Sciences, Chiang Mai University, Rajamangala University of Technology, University of Phayao, and Chiang Rai Rajabahat University.